New Bakery Franchise by San Miguel Corp. 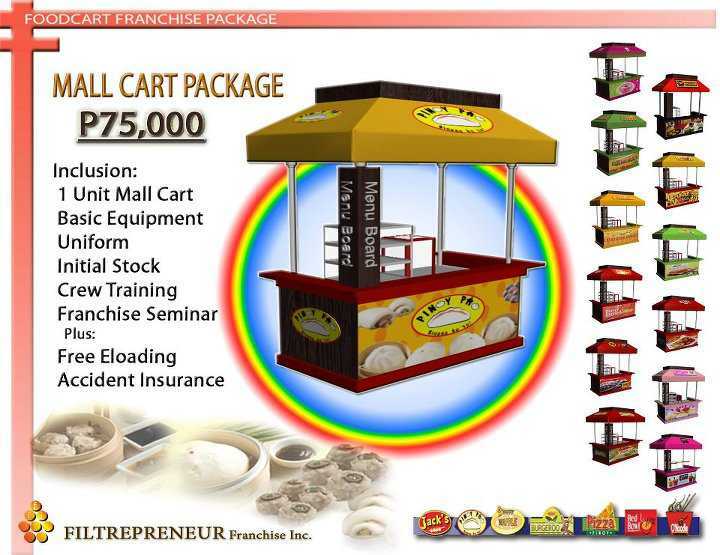 Franchise Philippines ranges from 75,000 to 250,000 Pesos. Why? Every Mall have their own standardization policy which strictly implement criteria like having a fiber glass cart, lighting's on signage, 6 feet height of food cart franchise or food cart business. They will relay their requirements to us and the franchising department will make the specified cart they allow to operate in their malls. Sm, Robinson, Esetann, Gaisano, Puregold, Walter Mart are among the top malls.